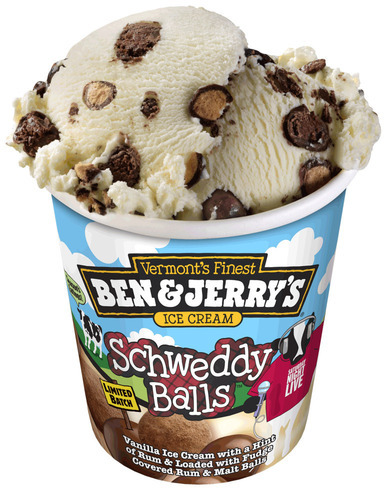 Parents call for boycott of Ben & Jerry’s Schweddy Balls flavor. 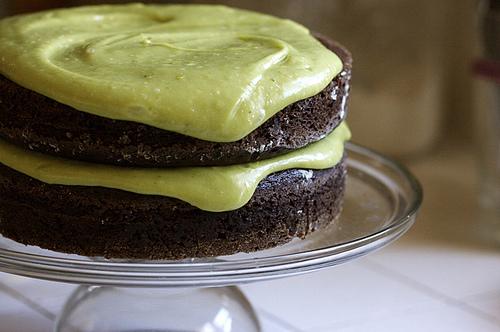 A neighbor of the MHK, who is responsible for a couple of the delicious recipes posted here, informed us that she had come across a recipe for vegan chocolate avocado cake. I know, those words don’t seem right together. But she made it, and generously supplied us with a slice yesterday. And it was…not bad. 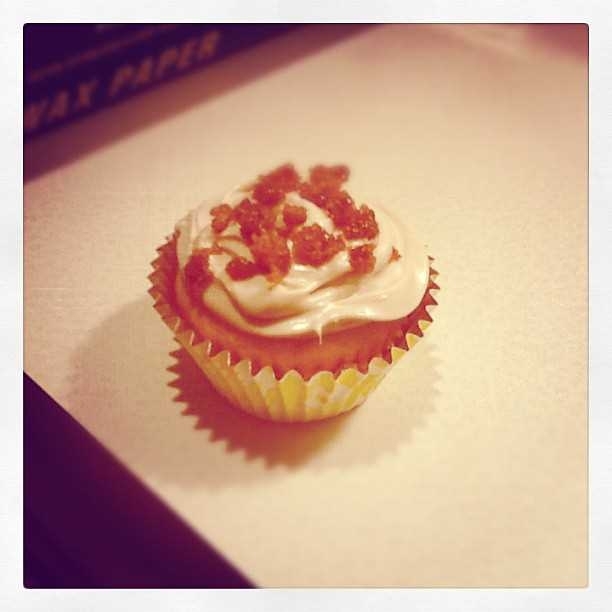 The icing was actually quite good, consisting of avocados, lemon juice, sugar and vanilla. The avocado served as a vegan substitute for butter, and the frosting tasted pretty close to regular buttercream. The cake was not nearly as successful, utilizing avocados in place of butter and eggs, and cocoa powder in place of any actual chocolate. The texture was ok, but it had no flavor at all. It didn’t taste like chocolate, and really wasn’t sweet enough. But when eaten with the frosting, it was certainly palatable as a healthier version of chocolate cake. Here’s the link to the recipe if you want to give it a shot. Let us know what you think. Enjoy! …he just might post the recipe. Time to take your mind off taxes today and bake something sweet. We found this recipe during the holiday season (and unfortunately I cannot recall the source, just a scribbling on a piece of paper), but if you like chocolate and mint, these are awesome any time of the year. Nothing fancy here, just a nice twist on the usual chocolate cookie recipe. The creme de menthe baking chips are actually easier to find than I expected. Enjoy! Heat oven to 350°F. In large bowl, stir cookie mix, butter, extract, food color and egg until soft dough forms. 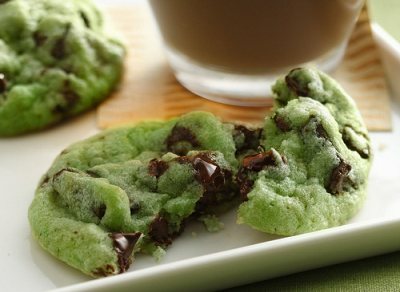 Stir in creme de menthe baking chips and chocolate chunks. Using small cookie scoop or teaspoon, drop dough 2 inches apart on ungreased cookie sheet. Bake 8 to 10 minutes or until set. Cool 3 minutes; remove from cookie sheet to wire rack. Serve warm or cool completely. Store tightly covered at room temperature. Eat! MHK reader Debbie brought this recipe to our attention last week; it apparently has been circulating around the interwebs for a couple of years, but it was the first we’d heard of it, so we gave it a try. Basically this is chocolate cake that can be made in five minutes, which is why it’s been labeled as the “most dangerous dessert.” Is it the best chocolate cake ever? No. Is it so good that you’ll want to make it every day? No. But for five minutes of work, it’s pretty decent. For those of you who have had that molten lava cake many restaurants offer, this is very similar (minus the liquid fudge center) in taste and texture; almost soufflé-like. One mug makes enough for two people, especially if you serve vanilla ice cream with it, which we highly recommend. Some experimenting with this recipe is probably in our future – we’re interested to see what happens if we reduce the amount of flour, add other ingredients like peanut butter or chopped raspberries, etc. If you have any good versions of this dish, let us know. Enjoy! Add flour, sugar, and cocoa to mug; mix well. Add the egg and mix thoroughly. Pour in the milk and oil and mix well. Add the chocolate chips and vanilla extract, and mix again. 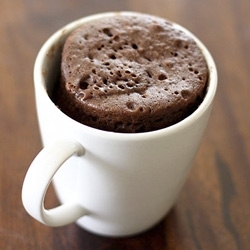 Put your mug in the microwave and cook for 3 minutes. The cake will rise over the top of the mug, but don’t be alarmed! Allow to cool a little, and tip out onto a plate if desired. Eat! MHK reader/neighbor Melanie recently bestowed upon us the wonderful gift of a cherry pie. It was, of course, delicious (I wouldn’t be mentioning it here otherwise). But there was something unique about the crust – it was light, buttery and flaky, yet held the pie filling well. Melanie was nice enough to impart her recipe for this magnificent malleable, which we now share with you. You might be taken aback by the vodka – but it makes the dough much easier to work with, and then evaporates during the baking process. 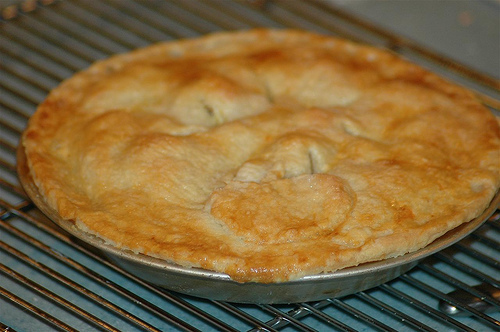 The next time you want to make a pie from scratch, use this crust recipe – you will not be disappointed. Enjoy! 1/4 cup cold water Process 1 1/2 cups flour, salt, and sugar in food processor until combined, about two 1-second pulses. Add butter and shortening and process until homogenous dough just starts to collect in uneven clumps, about 15 seconds; dough will resemble cottage cheese curds and there should be no uncoated flour. Scrape bowl with rubber spatula and redistribute dough evenly around processor blade. Add remaining cup flour and pulse until mixture is evenly distributed around bowl and mass of dough has been broken up, 4 to 6 quick pulses. Empty mixture into medium bowl. Sprinkle vodka and water over mixture. With rubber spatula, use folding motion to mix, pressing down on dough until dough is slightly tacky and sticks together (can do this part in the food processor too). Divide dough into 2 even balls and flatten each into 4-inch disk. Wrap each in plastic wrap and refrigerate at least 45 minutes or up to 2 days. Remove 1 disk of dough from refrigerator and roll out on generously floured (up to 1/4 cup) work surface to 12-inch circle, about 1/8 inch thick. Roll dough loosely around rolling pin and unroll into pie plate, leaving at least 1-inch overhang on each side. Working around circumference, ease dough into plate by gently lifting edge of dough with one hand while pressing into plate bottom with other hand. Leave dough that overhangs plate in place; refrigerate while preparing filling until dough is firm, about 30 minutes. Fill with your favorite filling and bake. Eat! The proud owner and founder of the Mouse House Kitchen turns [edited by owner] years old today, and we at the MHK have been granted most of the day off in honor of the event. But we did want to say a quick word about birthday cakes and such. Fascinating…ish. 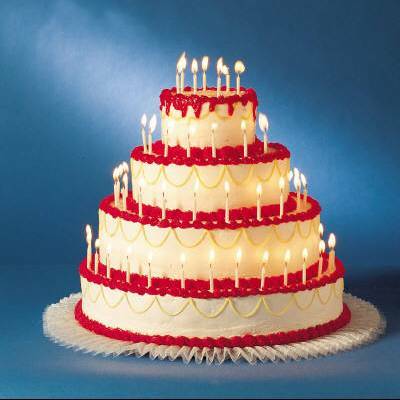 The most important thing, really, is what kind of cake/dessert do you prefer on your birthday? I grew up a big fan of ice cream cakes, but the traditional frosted cake always hit the spot. Throughout the years, I have grown more fond of birthday brownies rather than cake. And now after a few years of attending kids’ b-day parties, I am growing weary of the same traditional frosted cake over and over. Our beloved leader, the head Mouse himself, is off to a birthday lunch where he will be consuming a non-traditional birthday tiramisu. What’s the most unconventional birthday dessert you’ve had? Mousey minds want to know!